I already have hattrip to Goa, and planning again this year. Love for Goa and its beaches never diminishes. Best time to visit the beaches of Goa is between the months of September and March. The deep blue sea, soft sand, swaying palms and coconut trees, delicious seafood, water sports and night-life of the Goan beaches makes it a popular and most loved tourist destination. Star (*) mark beaches are good for one or the other reason and for photography locations. 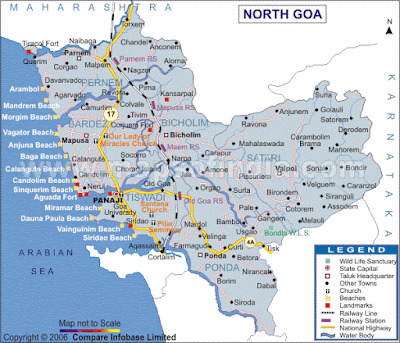 List of beaches in Goa are as below. Best North Goa Beaches: These beaches are full of water-sports, nightlife, activities throughout the year. A visit to Baga and Calangute is must for your itinerary. These beaches are famous for their extensive curved stretches, white sands and palm fringes. **Morjim Beach (Morgim Beach) - One of my favorite among all north Goa beaches, popularly known as the Turtle Beach. The Morjim Beach is special as it serves as a hatching and nesting habitat of the Olive Ridley turtles, which are an endangered species. The sight of the tiny hatch-lings, turtles and crabs makes your experience at the beach an unforgettable one. Kite surfing is another activity popular at this beach because of its shallow depth. *Vegator Beach (Nearby Chapora Fort): It boasts of pure white sand, doted with black lava rocks and swaying coconut and palm trees and lies within the backdrop of the 500-year-old Portuguese Fort and takes the visitors down the memory lane depicting the Old Portuguese era. Vagator's broad white sandy beach - Big Vagator Beach also known as "Little Vagator" is undeniably beautiful and offers picturesque vista with the red ramparts of Chapora Fort. *Anjuna Beach: The beach is famous for its stunning natural beauty with swaying palms trees and soft powered white sands. Now man-made stones are also being developed at one side for cleaner look. **Bagha Beach (Baga Beach): The lovely beach of Baga is one of the oldest preserved beaches in Goa. There are many shacks which are lively even during night famous all over the world. This is for sure the most happening beach in Goa. **Calingute (Calangute) Beach: Water Sports and nightlight at the beach. You can also try lighting up Chinese candles up over the sea, and it looks amazing during night. *Candolim Beach: This beautiful beach begins at Fort Aguada and ends at Chapora Beach. *Miramar Beach, Panjim: It is a golden beach fringed with palm trees. The soft sands of the beach makes it the best site for evening walks. Best South Goa Beaches: North Goa beaches are the crowded ones, but if you need few idle or peaceful beaches, South Goa would be the better side to roam around and relax. Clean blue water of the Arabian Sea gives you a pristine view of sea beds. 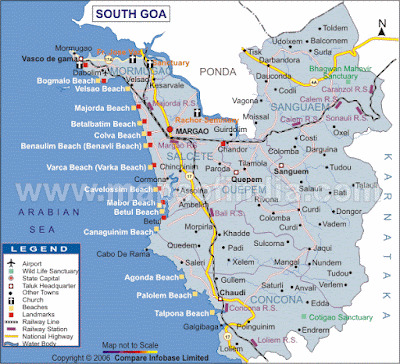 **Majorda Beach: It is one of the marvelous beaches in Goa that is located about 18 kilometers from Dabolim Airport. *Betalbatim Beach (Sunset Beach): For sunset and photography lovers. Each one of us has definitely been lucky enough to witness beautiful sunsets sometime but the beauty of the sunsets at the Betalbatim Beach is beyond imagination. **Colva Beach: The beach consists of fine powdered white sand and is bounded along its coast by coconut palms that stretch from Bogmalo in the north to Cabo de Rama in the south along south Goa's coastline. *Varca Beach: It is one of the cleanest beaches in Goa that allows the tourists to spend some time in solitude. *Mobor Beach: This beach is an ideal location for the adventure tourists. It is one of the most popular beaches in South Goa, which enables the tourists to indulge in adventure sports such as water skiing, water surfing, jet ski, banana and bump rides and parasailing. *Palolem Beach: The enthralling Paolem Beach instills in us a feeling of tranquility that is one of the major attribute of this serene Goa beach. Ref: Above maps are taken from mapsofindia.com. Keep enjoying all beach curves of Goa. which is the beach in the first pic of the post with the rocks? This is Anjuna beach. There are both man-made & natural rocks to roam around.